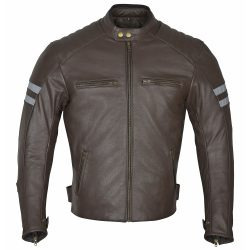 Motorcycle racing jackets are a special breed of riding jackets. The cornerstone of leather racing jacket construction is its ability to protect the rider against sliding and abrasion. This inevitably means the jacket should be at least 1.2 millimeter cowhide leather. 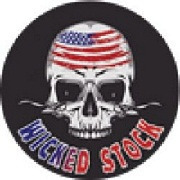 Here at Wicked Stock we make sure all of our riding jackets not only conform to this but we also stay ahead of our competition by providing double stitched seams and 270-degree pant connection zippers. In Wicked Stock, leather motorcycle racing jackets we generously use Kevlar thread for sewing seams. Kevlar thread is about two and half times stronger than nylon and polyester. We make sure our racing jackets are aggressively pre-shaped so as to provide maximum body support in a tucked riding position. This ensures snug fit around the high impact areas while allowing only reasonable freedom of motion. This aggressive fitment keeps your limbs in a safe position. Go ahead and choose your Wicked Stock leather racing jacket now. 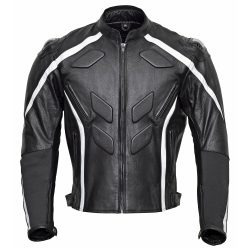 Also browse our textile category for other best options here: Textile Motorcycle Jackets.